Heart of the Ocean replica necklace. One of the most famous diamonds in the world never existed at all: the Heart of the Ocean. "La Coeur de la Mer" is the gem's proper name as introduced in the 1997 blockbuster movie Titanic directed by James Cameron. The gem, a stunning blue diamond, supposedly belonged to King Louis XVI, but disappeared during the French Revolution in 1792, when the King was beheaded. 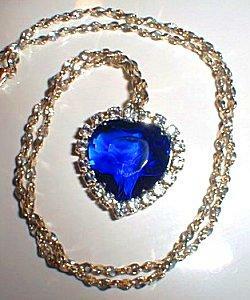 Later, the "Blue Diamond of the Crown" appeared as the re-cut Heart of the Ocean gemstone in a stunning pendant. According to the movie, Caledon Hockley (Billy Zane) bought the pendant as an engagement gift for his fiancée, Rose DeWitt Bukater (Kate Winslet), a week before sailing on the Titanic. The gemstone makes its first actual appearance (not a photograph or drawing) 46 minutes into the movie as Cal presents the gift to Rose, explaining that he'd planned to wait until their engagement party, but since she was so distraught (she'd nearly fallen off the ship's stern that evening) he thought to give it to her sooner to demonstrate how he could provide for her. In a fitting and romantic end to the movie, Rose tosses the necklace overboard at the site of the Titanic's sinking, letting the gemstone be a link between her and her lost love.Later in the feature, Rose insists that her newfound love, Jack Dawson (Leonardo DiCaprio), draw her picture wearing only the famous gem. Infuriated with her behavior and seeking to discredit the third-class Dawson, Cal arranges to have the pendant planted on Jack, who is then arrested as a thief. In the confusion of the sinking, Cal inadvertently returns possession of the necklace to Rose, who discovers it after she has debarked in New York. She has broken ties with Hockley, and instead keeps the gem for decades, until interest in it resurfaces when Brock Lovett (Bill Paxton) begins salvage operations on the sunken liner. The picture Jack drew is aired on television, and the then 101-year-old Rose (Gloria Stewart), visits the research vessel and tells her story. While the Heart of the Ocean and its story is a work of fiction, the stone was inspired by the infamous Hope Diamond. The real gem's notorious legends and tales of woe are a perfect accompaniment to the tragedy of the Titanic's sinking and James Cameron's story of true love savagely cut short. The stone's appearance and cluster setting are also reminiscent of the Hope Diamond. The Heart of the Ocean is an even more impressive gem than the Hope Diamond (Hollywood having the license to make anything more extravagant for the big screen). At a whopping 56 carats, the gemstone measured nearly two inches in length. Surrounded by smaller colorless diamonds and accented by additional diamonds mounted to the 18 inch chain, the heart shaped gem is a work of art even before it is memorialized in a stunning pencil sketch. Using a blue diamond as an iconic symbol is perfect for a romantic tragedy. The rich blue color not only denotes luxury, but it also is a traditional color for sadness and despair - a prelude to the tragedy to come. With a distinctive heart cut, it is reminiscent of the romance and love the movie's tale presents. Ironically, the fictional gem is also similar to the oval sapphire surrounded by diamonds that constituted Princess Diana's engagement ring - another romantic tale that ultimately ended in tragedy. Today, the "Titanic necklace" is a popular trinket for movie fans and wistful romantics alike. The immense popularity of the movie prompted the House of Harry Winston to recreate the pendant for the startling cost of $20 million, but fans of the movie can easily find replicas for far lower prices. While no additional real gemstone replicas are available ( blue diamonds being exceedingly rare and expensive), plastic or crystal duplicates can be purchased for relatively low prices, typically ranging from $30-100 depending on the accuracy, detail, and size. Because the movie gem was indecorously large, the most popular replicas are smaller sizes but include enough detail - the surrounding white gems and appropriate chain length, for example - to be suitable replacements. While immediately after the movie's release and sweeping Academy Award honors there were many companies offering replicas, they are more difficult to find today - online auctions are now the easiest way to find replicas. For movie fans who appreciate the symbolic beauty of the pendant's design but don't want to wear such a weighty necklace, specialty companies have also designed gemstone rings and earrings in similar blue-stone-surrounded-by-white-stones configurations. The Heart of the Ocean is an instantly recognizable piece of diamond jewelry, well known for its tragic yet romantic past as well as its stunning beauty. The fact that the necklace never really existed is far less important than the romance, commitment, and devotion it represents.